JAGUAR LAND ROVER COMMITS TO ITS CONTINUED PARTNERSHIP WITH ASTON UNIVERSITY TO INSPIRE THE NEXT GENERATION OF SKILLED LOGISTICS ENGINEERS. On 24 November, another successful Logistics in Action event took place at Jaguar Land Rover’s Education & Business Partnership Centre in Castle Bromwich. The event was organised by the Global Material Planning and Logistics International and Powertrain Programme Management team, in partnership with Aston University. Over 40 students from Aston University studying Logistics took up the opportunity to witness JLR’s world class supply chain in action. 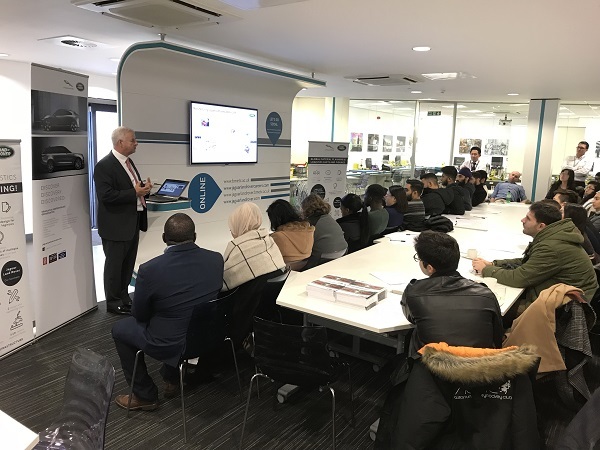 The event provided students with an insight into the world of automotive logistics and an understanding of current career opportunities on offer. Jason Chung, Logistics Programme Manager - China, opened the event by introducing the students to Jaguar Land Rover, its decorated history and exciting future. The students also got an insight into the true scale of JLR, its facilities, the various cars we produce, our competitors and just how quickly we are growing as a company. This was followed by an insightful talk from two of our current graduates, Yasir Rashid and Alba Rodriguez Flores, who also graduated from Aston University. Yasir and Alba talked about their recent experiences within JLR, giving an insight into graduate roles, extracurricular actives and the supportive culture within JLR. Later, students took part in a great interactive session which presented them with real life scenarios to showcase how simple 5S techniques can be used to prevent issues and demonstrate the importance of standardised work within the manufacturing industry. The day was complemented by a plant tour of Castle Bromwich during which the students witnessed the production process from start to finish. The event was wrapped up by Martin Flynn, Senior Manager - International and Powertrain Programme Management, who gave an overview of the automotive supply chain and how each of the departments within MP&L interact during the life cycle of a car - from raising an order to final delivery to the customer. Finally, students were given the opportunity to enjoy some lunch whilst networking with current employees and graduates. We wish to continue this fruitful collaboration with Aston University in future and look forward to next year's event. A big thank you to Martin Flynn, Alba Rodriguez Flores, Yasir Rashid, David White, Jonas Gegembauer and Jason Chung for their efforts!